Every Thursday starting at 3 pm, someone walking through Miller Community Center would notice stacks of sturdy cardboard boxes with the moniker “Full Circle Farms” printed on them. Welcome to Community Supported Agriculture at work. CSA has been steadily gaining steam across the country and very prominently in the Pacific Northwest over the last several years. The idea is that consumers buy produce directly from a local farm. This supports local farmers and lets consumers feel good knowing their produce is as fresh as possible and, as a general rule, organic. Although CSA is great in theory, sometimes it can leave the consumer wanting. Full Circle Farms nails it in terms of a customizable product and customer satisfaction. First, you choose whether or not you want a standard or family size box and how often you want to get it. You can have it delivered to your home for a nominal fee, or you can pick it up at at one of many convenient locations. Once you have your delivery preferences locked down, you customize your box in the form of permanent exemptions and weekly adjustments. Each week that you’re scheduled for delivery, you will get an email reminding you to check out that week’s box contents, and then you choose exactly what you want – and don’t want – in your box. There is no maximum number of substitutions and you can duplicate items. So, if you want a box full of okra and strawberries, that’s your prerogative – as long as FCF is offering those items that week. FCF also has full disclosure about where their items originated, either at the farm itself or from one of its partners. No matter the origin, all produce is organic. And, to make this service even better, you can add grocery items to your box for an extra charge. This is anything from eggs and dairy to bread and pasta to meat and seafood to some of the best chocolate you’ll ever taste. Finally, Full Circle Farm is dedicated to promoting local food awareness and education and is a partner in local Farm2Table programs. 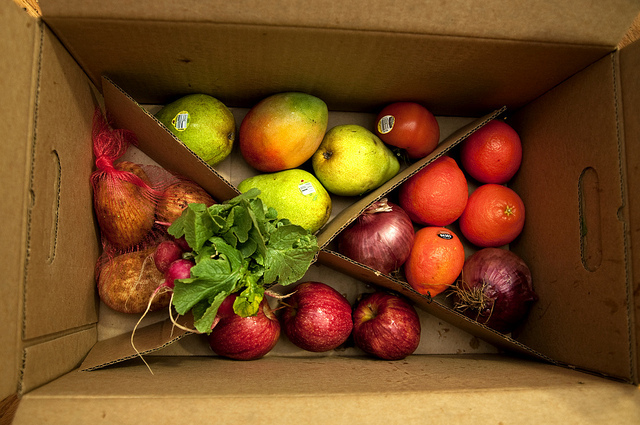 So, the next time you pass through Miller CC on a Thursday, rather than looking with envy at the boxes chock full of fresh, organic produce, why not become a FCF member and pick up your own box?